The London "Bobby" unlike all others! The most beloved of British serials that ran for 430 episodes for an entire generation - and no-one appears to have thought this worth commenting on! No series before or since has generated the viewer affection that PC George Dixon managed. An extension of the tremendously popular Basil Dearden film of 1950 entitled THE BLUE LAMP, brit actor Jack Warner was so typecast in this role, he received truck-loads of fan-mail for almost twenty years addressed simply to "PC Dixon." He was loved and idolised by millions right up until his death from pneumonia in 1981. I remember clearly the first episode in 1955, it was just one week after we got television...a tiny 12" screen in grainy black and white! I watched that show all my childhood. I grew up with the characters in it, yet PC Dixon NEVER changed. The epitome of one's concept of British dignity and decency, PC Dixon had a heart bigger than any. 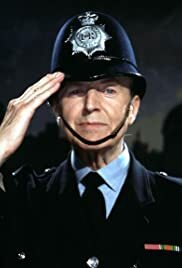 Selfless, tireless, incorruptible and representing pretty much everything that modern society has rid itself of, the stalwart of fictional Dock Green Police Station rode his bike from adventure to adventure. No smart comments, no punch-ups, bad language ANYTHING vaguely indelicate. Yet you KNEW after each episode that crime really does not pay and that we all had a choice in life. I wish more than anything that I could meet PC Dixon today. He alone could re-establish my childhood beliefs and dreams.